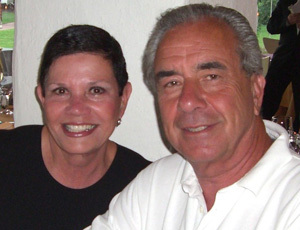 Gloria and Kenneth Levy provided major support for the APF's spectrometer. Lick Observatory will honor Kenneth and Gloria Levy as the first recipients of the James Lick Award in recognition of their generous support for the observatory's newest telescope, the Automated Planet Finder (APF). The APF telescope will be devoted entirely to the search for planets orbiting nearby stars, with the goal of finding an Earth-like planet in another solar system. In 2007, a major gift from the Gloria and Kenneth Levy Foundation helped fund the world-class spectrometer that is central to the APF's mission. Kenneth Levy built his career around a pioneering Silicon Valley firm, KLA (now KLA-Tencor), that he founded in the 1970s. He was the firm's CEO for more than 20 years and served as chairman of the board from 1999 until he retired in 2006. He and his wife, Gloria, are involved in philanthropy through their foundation. The Levys will receive the inaugural James Lick Award at a special evening event on Saturday, September 26, when Lick Observatory will be celebrating the 50th anniversary of the 3-meter Shane Telescope and the 400th anniversary of the first use of a telescope for astronomy. The award was established to honor individuals or organizations that have significantly advanced the mission of Lick Observatory. "We greatly appreciate the Levys' support, which came at a crucial time to make the APF a reality," said Michael Bolte, director of UC Observatories (UCO) and professor of astronomy and astrophysics at UC Santa Cruz. "The discovery of planets orbiting other stars a little more than a decade ago ushered in a new field of science. Work at the Lick Observatory 3-meter telescope has been crucial to establishing this new field, and the APF will ensure that the University of California remains at the forefront in this area." The APF telescope, with its 2.4-meter (94-inch) mirror, was installed in a new dome on Mt. Hamilton over the summer. It will be fully automated and equipped with a spectrometer optimized for a planet-detection technique that relies on precision measurements of starlight. The spectrometer, which is nearing completion in the UCO shops, was designed by Steven Vogt, professor of astronomy and astrophysics at UCSC. "We should have it installed on the telescope and operational by the end of the year," Vogt said. "The APF will be the largest telescope fully dedicated to finding planets orbiting other stars." The spectrometer enables astronomers to detect the tiny wobble induced in a star by the gravitational tug of an orbiting planet. Vogt's past designs include the two most successful planet-finding spectrometers in operation today--the high-resolution "HIRES" spectrometer, mounted on the 10-meter Keck I Telescope at the W. M. Keck Observatory in Hawaii, and the Hamilton spectrometer on the Shane Telescope at Lick Observatory. In addition to Vogt, the collaborators on the APF project include astronomers Geoffrey Marcy of UC Berkeley and Debra Fischer of San Francisco State University. Major funding for the APF telescope and dome was provided by a grant from the U.S. Naval Observatory, with additional contributions from project collaborators. Funding for the spectrometer was provided by NASA, the Levys, and project collaborators. The event at Lick Observatory on September 26 will raise funds to support the completion and operation of the APF. Tickets are still available for the event, which includes a strolling dinner; a lecture by planet hunter Geoffrey Marcy; tours of the observatory; and (weather permitting) viewing with the telescopes. For details and reservations, visit the Lick Observatory web site or call (831) 459-5003.